From the Book Jacket: Leah and Dexter are brother and sister. They don't always get along. In fact, there are times they can be down right mean to each other. 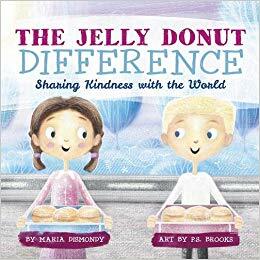 They ooey, gooey jelly donuts in this story are a testament to the power of kindness, caring and generosity. Why It's On My Bookshelf: Our school will be participating in The Great Kindness Challenge and this is such a wonderful book to help us teach our students about good deeds. Leah and Dexter both learn about the power of kindness by extending themselves and doing caring acts for their elderly neighbor. She teaches them about a baking tradition in her family and that's when they begin about the power of paying it forward. So happy to add this to my collection!